Eat your heart out, Guy Fieri! Seattle Southside is filled with some of the best greasy spoon hot spots in the Pacific Northwest. So, hop into your drop top ’69 Camaro (isn’t that what he drives?) and cruise down Pacific Highway S for a delicious day of diners, drive-ins and dives! If you’re starting your journey in the morning, you’re going to want some breakfast. 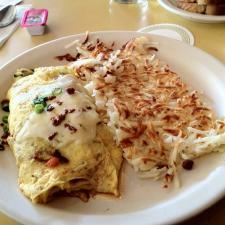 Well, there are few better spots for a hot breakfast than the Pancake Chef in SeaTac. They’ve been at the same location since 1959, serving classic and unique breakfast and lunch dishes that keep people coming back for more. Try a German pancake, apple cinnamon crepe, Mexican omelet, banana fritter, chicken fried steak or a delicious pancake sandwich! You heard right…the pancake sandwich squeezes eggs and your choice of meat between three buttermilk pancakes! This one makes the McDonald’s breakfast menu look like a prison chalkboard. Next stop, lunch at Dave’s Diner & Brew. Dave’s is a classic 50s-style diner filled with Route 66 décor, friendly staff, and the epitome of classic American cuisine. We’re talking rib-eye steaks, Dagwood sandwiches, and homemade meatloaf! If your gut is already busted from the last stop, fear not, for they have several heart healthy options too! You see? You could stick to a healthy diet, even in the 50s. Did I mention they have fresh baked pies and desserts, plus an extensive breakfast menu! All right, forget the diet. If you have some room left, continue south down Pacific Highway to Bob’s Burgers! No relation to the cartoon, but trying this hole-in-the-wall burger/teriyaki joint for the first time is like finding El Dorado. I mean…delicious greasy burgers, Philly cheesesteaks, crinkle cut fries, chicken yakisoba and beef bulgogi. What more could you ask for? They do a little of everything here and they do it right! Ask the locals. They (we) know. Des Moines Dog House: An exceptional hot dog shack just off the Des Moines Waterfront. They serve unique hot dog creations, oftentimes with a Columbian twist. Some of the top picks here include: Louisiana hot link, Seattle dog (beef hot dog with cream cheese and caramelized onions), Columbian chorizo sausage, and arepas and sausage! Wally’s Chowder House: A simple seafood and chowder joint – fish and chips, prawns and chowder, fish tacos and even some fresh lobster! No matter what you get, you must try their homemade tartar sauce…amazing. It’s no wonder this place is currently sitting at the #1 spot for TripAdvisor’s top restaurants of Des Moines. *Randy’s Restaurant: We couldn’t craft a list of the best diners in Seattle Southside without including Randy’s, now could we? The asterisk is only indicating that this one isn’t on Pacific Highway or International Boulevard, it’s on E Marginal Way right by The Museum of Flight. 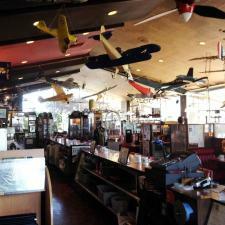 They work as a nice complement to the Museum of Flight; so much so that they use the moniker, “the museum of bite!” The owner Richard Roadenizer is also an Army Airborne/Air Force veteran and they’ve stocked the place full of aviation/military artifacts. Try the B52 buffalo burger, Randy’s Dandy Bomber (omelet) and be sure to get an ice-cold chocolate milk or malted shake.